Moving delicate and breakable items can be quite the challenge. So, why don’t you give yourself a break and have us plan and carry out the task for you. We are seasoned man and van contractors and we have the needed assets to properly and safely pack, load and transport any type of fragile objects. We use the finest hardtop containers to keep the moved items from harm’s way. If necessary we will add supplementary layer of protection by wrapping the containers into bubble wrap or placing them in boxes which we have filled with packing peanuts. If the objects are too large to be placed in hardtop containers we will cover them with cushions and furniture blankets in order to keep them safe and in immaculate condition. All the items will be carefully loaded into our van and we will be secured and anchored in place via the safety features which we have installed in our vehicles. Our professional drivers are experienced professionals who possess the necessary know-how on how to correctly and efficient transport fragile and delicate objects. You can learn more about our Greater London removals and methods of work by either giving us a call or sending us an e-mail. Our customer consultants are friendly and polite professionals who will answer in details to all your questions. Once you contact us don’t be shy and request a quote, so that you can see for yourself that we work with very affordable prices. Bear in mind that our quotes are free of charge and obligation. 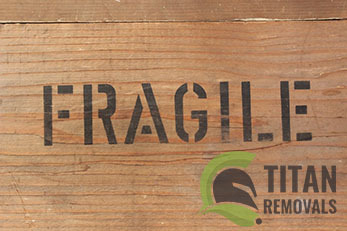 Naturally, we will take all the precautions to make sure your fragile item moving is handled in the safest manner possible. But we will also do what is necessary in order to complete the job on a tight schedule entirely tailored according to your preferences and needs. Our flexible schedule comes with large availability and leaves room for last minute booking and even late night operations related to fragile item moving in London, if that is necessary. Titan Removals operate in London, the capital of England. It is one of the largest and most populous cities in the world with an estimate population of 13 million residents, metropolitan area included. It is home to numerous prominent landmarks such as Buckingham Palace, the British Museum, the London Eye, Wembley Stadium and the Palace of Westminster. Travelling to and from work in London is usually easy and quick, because of the extensive underground and overground railway network. Actually, London was the first city in the world to have a tube. Most of the tunnels run in North London. The southern parts of Greater London are predominantly serviced by above-the-ground railway. Both networks are product of the technological advances that were made in the middle of the 19th century.